Where is your front sling-swivel attached? NOTE: sling-swivel must be 1¼" standard military width to accomodate our slings. *REQUIRED for Sure-Fire Millenium forends. 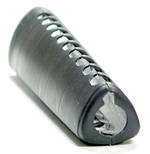 If you have a SURE-FIRE MILLENIUM FOREND light on your gun, a front side-swivel is REQUIRED due to the light and switch positions. GG&G "Sling Thing" side-swivel adapter available. Where is your rear sling-swivel attached? CAR-15 SIDE-MOUNTED rear sling-swivel (aftermarket adapter). CAR-15 SLOTS instead of swivels: classic Colt type I (top) and Colt type II SOCOM rib-reinforced/Rock River (bottom). MAGPUL M93-series stocks may have a Single-Point sling attachment which can be mounted on either side. To fit a 3-point Giles Tactical Sling™ a Wildereness adapter must be used with a 1¼" sling swivel, or a Single-Point sling adapter may be used for an alternate rear attachment. VLTOR stocks, including the original Modstock, Emod and iMod buttstocks, include swivel sockets for push-button Q.D. swivels. A standard AUG/Dual-Side Swivel AR, or Quick-Fit Adapter and 1¼" push-button sling swivel are correct choices. 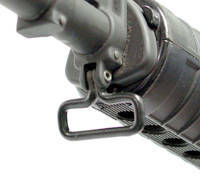 LMT SOPMOD stocks have either a horizontal slot (older version) or a swivel socket for push-button QD swivels (2010+). 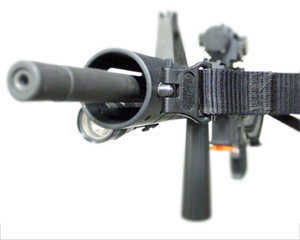 The older stock requires a GG&G Sling Thing with LMT adapter option. The newer units with sockets require a 1¼" swivel which can be attaches to an AUG/Dual Side-Swivel AR sling, or Quick-Fit 1¼" Adapter. SINGLE-POINT attachment included which can be mounted on either side. Must be a version with a 1¼" sling slot, not a ring. 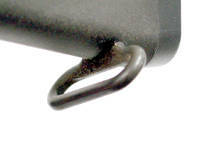 Typically used with the Wilderness Single-Point Sling; can be used with a front side-mounted sling swivel to mount a universal/AUG Giles Sling. 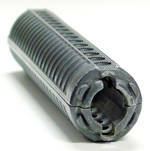 Which forend/handguards are on your rifle? 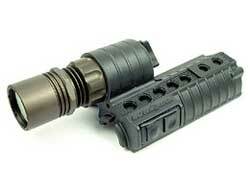 AR handguards/forends can come in numerous variations. Most A2 and CAR handguards have a ROUND cross-section. 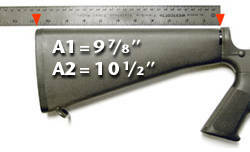 A1 handguards have a TRIANGULAR cross-section. MIL-STD-1913 Rail Systems. Must use side swivel attachment for Giles Sling such as GG&G Sling Thing. 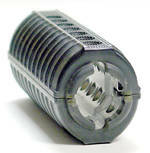 Rail systems CAN NOT use the wraparound webbing harness for the round or oval plastic handguards. It will generally not fit, and the rails tend to cut and abrade through the harness over time. FREE-FLOAT forends (Armalite, Knight's, PRI, etc.). Sling swivel stud must be on the side facing the shooter at either the 9:00 o'clock or 3:00 o'clock position. 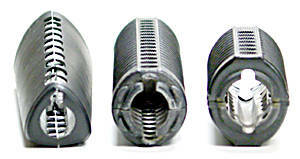 Armalite forends can be rotated to index the stud properly. If you have a SURE-FIRE MILLENIUM FOREND light on your gun, a front side-swivel is REQUIRED due to the light and switch positions. 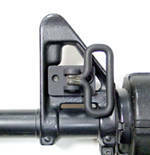 GG&G "Sling Thing" side-swivel adapter available. Left-hand users will need to use a Michiguns sling cable. Which buttstock is on your rifle? Because fixed A1 and A2 stocks can have numerous similar features depending upon date of manufacture, the easiest way to differentiate them is by length. Older FIXED A1 buttstocks are 9-7/8" long from the back of the gun's reciever to the back of the buttplate. Newer FIXED A2 buttstock is 10-1/2" long from the back of the gun's reciever to the back of the buttplate. 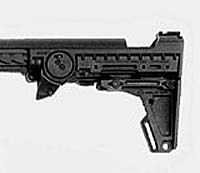 Traditional STANDARD CAR-15 (Colt Type I and similar) buttstock with top and bottom slots. newer RIB-REINFORCED (Colt Type II SOCOM M4A1 and Rock River M4-type) stocks are ribbed, have an angled buttplate and no top sling slot. MAGPUL M93 stocks may have a Single-Point sling attachment included. 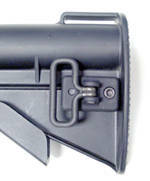 To fit a Giles Tactical Sling™ to an older M93 stock, a swivel stud adapter must be used with a 1¼" sling swivel. 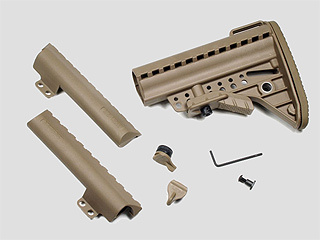 For M93B stocks a push-button swivel socket/reinforcement bar from Magpul must be installed.